We discovered a big and prosperous company. We think it is a great avenue to invest in that certain company. We want to become one of the owners. What can we do? Normally, in big companies like Walmart, Johnson & Johnson, Microsoft, Google, and Apple, they release a large number of shares to the public. You may also see modern certificate examples & samples. What is a share? 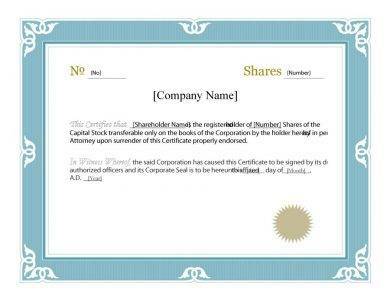 A share, or a stock, is a person’s share in the ownership of the company and represents a claim on the company’s assets and earnings that is evidenced by a share certificate. 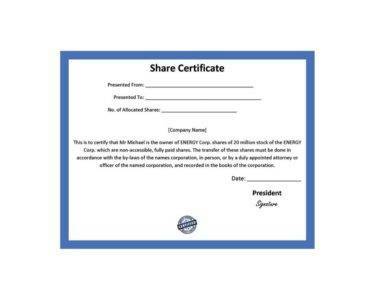 A share certificate is a written document issued by a company that serves as a legal proof of ownership of one or more of the company’s shares. 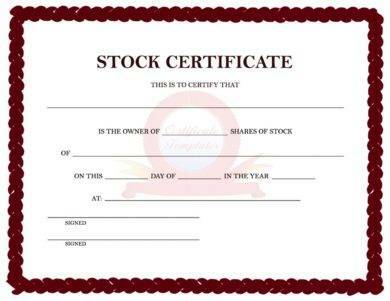 You may also like examples of certificate of appreciation. Hence, when you want to acquire ownership in a certain company, make sure that you have been given shares of stock following your acquisition to secure your ownership. 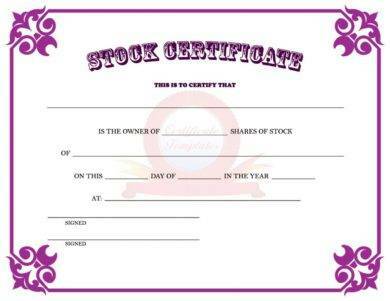 Check out the shares of certificates examples given below. When you want to acquire a company’s certain shares of stock, you are given the liberty to choose the type of share that you are going to purchase. However, you do not know what are the different types as well as the risks and rewards for each type of share. You may also check out examples of certificate of achievement. To help you overcome with this challenge, discussed below are the different types of shares and their corresponding risks and rewards. Ordinary shares are the most commonly traded shares that represent the company’s voting rights and reflect the equity ownership of a certain company, typically carrying one vote per share. Additionally, these shares give the right to the distribution of the company’s assets in the event of winding up or sale of the business. You may also see certificate examples in pdf. The holder of the preference shares literally has a preference to payments of dividends or on winding up of the company over ordinary shares and has voting rights that are restricted to particular circumstances or particular resolutions depending on the terms of the shares. You may also like award certificate examples and samples. These shares are issued without requiring the full payment of the issue price. The holder of these shares has the same rights as an ordinary shareholder as regards to voting, dividends, and winding-up rights, proportional to the amount paid on the share. These shares carry fewer rights than ordinary shares. Their rights include rights in the shares in which dividends are only paid after all other classes of shares have been paid, shares in which dividends are only paid after a certain date, shares that are not tradable until a certain date, and shares that do not give their holders any rights until all other shareholders are paid such as in the event of insolvency. You may also check out examples of certificate of completion. These shares do not give the holder any voting rights, and the holder is not able to take part in its general meetings although he is entitled to a portion of the company’s capital. 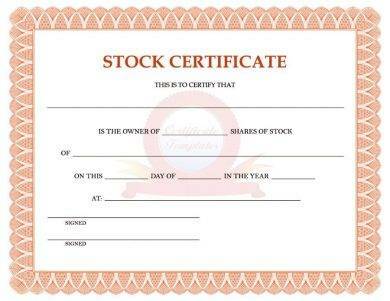 These are mostly issued to employees or to family members of the main shareholders. These are shares that can be bought back, or redeemable, by the company at some point in the future. The redemption date can either be fixed or be decided at the company’s discretion usually for the same price as the issue price. However, a company can only redeem shares out of profits or the proceeds of a new share issue. You might be interested in examples of certification of participation. These shares combine the features of preference shares and redeemable shares in which the shareholder benefits from the preferential right to dividends, which may be either cumulative or non-cumulative, while the company can redeem or retains the ability to redeem the shares in the future. The holders of a cumulative preference share will have the right to the cumulative dividend that is missed or not paid in full. There are times that the company cannot pay in full the dividends for the current period, and will only pay them when it has already sufficient distributable reserves. For ordinary shareholders, they will not receive any dividends unless all the dividends in arrears for the cumulative preference shares have been paid. You may also see examples of sports certificate. These shares give the holders extra voting rights at the company’s general meetings, which is advantageous for the holders because it enables company directors to retain control of the company when the shares are issued to outside investors. These shares are a subclass of ordinary shares. 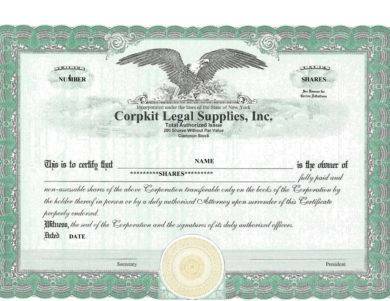 These allow a company to vary the rights attached to shareholders. These are termed such because alphabet letters are used to label a class of share with each class having different voting rights, rights to dividends, as well as rights to capital. These shares therefore enable companies to enhance or restrict certain shareholders’ rights. You may also like training certificate examples and samples. You may also see certificate examples in word. You may also like award certificate examples and samples. These are the highest and lowest prices of traded stocks over the previous 52 weeks. The company name is listed with or without special symbols or letters following the name. 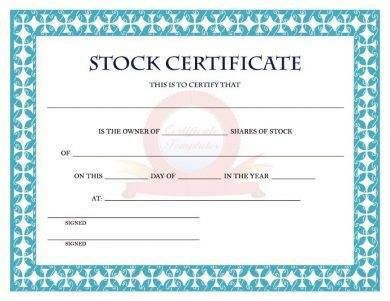 No special symbols or letters means it is common stock. Different symbols imply different classes of shares. You may also see certification templates & examples. This refers to the unique alphabetic name which identifies the stock. This is the annual dividend payment per share. This refers to the percentage return on the dividend. The current stock price is divided by the earnings per share from the last four quarters. This shows the total number of shares traded for the day which are usually listed in hundreds. This signifies the price range, the maximum and minimum prices, of the traded stock throughout the day. You may also like certificate of achievement examples. This is the last trading price recorded upon market closing. The presentation of the entire listing for a certain stock will be in bold face if the closing price is up or down more than 5% than the previous day’s close. However, it is not guaranteed that you can get the price if you buy the stock the next day; this is merely an indicator of past performance and serves as a ballpark of what you should expect to pay. You may also check out what is an academic certificate? This refers to the change in the stock price from the previous day’s closing price. 1. Supply and demand in the market determines the price of each share. When there is an increased demand for a certain stock than its supply, naturally, the price of the share would move up. On the other hand, when there is an increase in the supply of shares in the market, the price of the share would fall. You may also see completion certificate examples. 2. The value of the company is represented by the price of their stocks or shares. Price times the number of outstanding shares, known as the market capitalization, is the value of a company. Hence, it is not reasonable to compare just the share price of two companies to determine the company value. You may also like define certificate of occupancy? 3. The investors’ valuation of a company is theoretically affected by the earnings of the company. However, there are other indicators to predict the price of the stock such as the investors’ sentiments, attitudes, as well as expectations. 4. Peoples’ estimates will be different from one another; some give a higher expected stock price while others a lower expected stock price. You may also check out gift certificate examples. 5. There are a lot of theories trying to explain how the stock prices move the way they do, but there is not a single one theory that can explain everything. 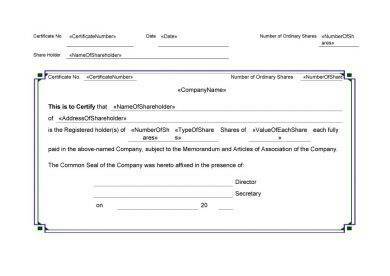 As a summary, shares are a company’s portion of ownership that can be purchased by anyone interested in the business and is evidenced by a legal proof of purchase called share certificate. Before you buy a share or shares from a company, make sure that you are certain that the company is doing well in its profitability, and you must secure your purchase through a share certificate. Furthermore, you must know the basics with regard to shares so you will have the idea on the risks and rewards that you are going through with your investment. 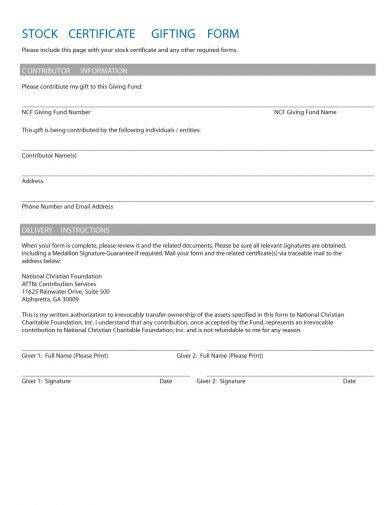 You may also see gift certificates. Shares are to be sorted into different classifications for reasons like to attract investment, to push dividend income in a certain direction, to remove or enhance other members’ voting powers, and to motivate staff. The different types of shares are as follows: ordinary shares, preference shares, partly paid shares, deferred ordinary shares, non-voting ordinary shares, redeemable shares, preference shares, redeemable preference shares, cumulative preference shares, management shares, and alphabet shares. You may also like how to showcase certifications on resume. Moreover, you must also know how to read a stock table as well as how are the stocks or shares valued. These are all presented in the above. 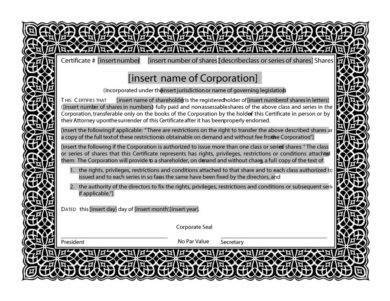 Lastly, don’t forget to check out the examples of share certificates provided in the previous section.